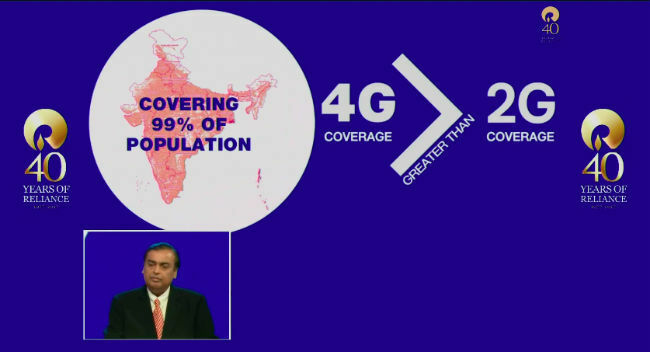 Reliance Industries Limited Chairman Mukesh Ambani at the company Annual General Meeting on 21 July, there he said Jio users consumed more than 100 crore GB of data in the last one month. That is more than 3.3 crore GB per day, now Jio is world’s largest and number one Indian mobile network. He also said Voice calls will always be free on the JioPhone and wants to cover 99% of Indians with their services. Reliance Jio runs the fastest data network in the country by the report of Telecom Regulatory Authority of India. The report shows that Jio had an average network download speed of 16Mbps, there Idea and Bharti Airtel, who measured in at 8Mbps and 7Mbps gradually. The JioPhone effective price is rupees zero. (User can buy the phone at security deposit of Rs 1500, which will be refunded after 3 years). JioPhone users will have to pay just rupees 153 a month, including the cost of the phone. This unlimited data has 0.5GB or 500 MB FUP per day, which comes to 14 GB for the recharge period. JioPhone users will have a weekly plan of rupees 54 and a two-day plan of rupees 24 with all the same features. JioTV app on their television, users will have to recharge with rupees 309 per month.